There are many children who live in need throughout Israel. What is worse is that many of them don't have to. Among the children who are most in need are those whose families were expelled from Gush Katif in 2005. Families who were productive, self supporting and contributing members to society had everything ripped away from them by the government all in the name of a peace which never occurred and a political move that created havoc for Israel's security for the past decade. Today, the youngest child expelled from Gush Katif is 10-years-old. Many of these children and their families are living below the poverty line. Without a business, without credit and without a home these families were forced to scrape by and have been kept in poverty due to the decade old political move. To help alleviate at least part of the national travesty that was the pull-out from Gush Katif, Shai Gefen from the Museum for Gush Katif, in partnership with Aryeh Weingarten from the Karmey Chesed organization, are hosting on Thursday their annual Lag B'Omer holiday celebratory event for children who were expelled from Gush Katif and their families. The event is to take place at the Action Park in the Lachish, located just outside the southern city of Kiryat Gat. Over 3,000 children from across Israel are expected to attend the eight hour event. "We partnered with Karmey Chesed to create a day of fun for free in which we brought former Gush Katif children, children who have been affected by the wars with Gaza, and victims of terror from all over the south, as well as the rest of Israel," Gefen told Breaking Israel News. "It is just one small thing that we can do." "The children and their families deserve us to give, but they also deserve more than that. They deserve us to give with a smile. It picks them up, and fills them with self esteem. Suddenly their cares are gone for a day and they can be children and have fun," Gefen continued. The jam-packed day of fun includes playground activities, sports, carnival equipment to play on and a fair like atmosphere. In traditional Israeli holiday festivities, hundreds of families will spend the day gathered around their barbeques. This isn't the first time that Karmey Chesed and the Gush Katif Museum have teamed up. They've been at this for six years. "The partnership is very successful," says Gefen, "Karmey Chesed helps us out incredibly." 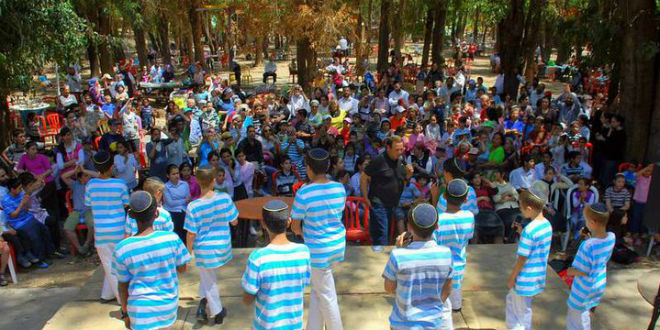 As part of the activities which the two organizations partner on, the Lag B'Omer celebration is aimed specifically at bringing joy to the lives of the children. Other activities in the past have included more family oriented goals, helping families in need pick themselves up and get a step ahead in life. Karmey Chesed works around the clock to provide for needy families all over Israel. In past events, Karmey Chesed has handed out much-needed clothing, food, furniture and financial assistance to families in need at the event. "Families who are in need get whatever assistance we can give them," explained Gefen, "and they get it with a smile." Gefen speaks very highly of his partner organization. "Karmey Chesed is simply amazing. Every single request that we have asked for on behalf of the Gush Katif evacuees, they have answered. They have answered so many families, and so many families still need it. We have literally helped hundreds of families to provide for their children." "We are talking here about charity and giving of a type that is incredibly unique, you do not only help but you help hundreds of people the amount alone is simply astonishing. People who have actually nothing receive entire house loads of supplies.," Gefen continued. "For these families it is not only important to give them what they need but to give them in a way that is above and beyond and with a smile. Karmey Chesed gives to them with caring and love. To give with love, that I think is the uniqueness of Karmey Chesed and of Aryeh Weingarten and it has proven itself over and over again."